This incredible 7-piece band is led by Austrian bassist Stefan Redtenbacher, who draws his inspiration from jazz, funk and soul. Stefan has established himself as the UK’s groove bass player of choice for numerous high profile artists, including Steve Winwood, Sam Brown, Herb Alpert and Danny Gottlieb, while his own recordings feature “jazz/funk” legends Fred Wesley (Parliament, James Brown) and Elliot Randall (Steely Dan). The Funkestra’s name pretty accurately describes the high-energy feel of the music as this band, with its fiery two-horn frontline and slinky guitar, perform original funky grooves with an authority and style that is hard to beat. With 11 albums already to their name, tonight the band will be performing music from their latest recording, “Part of Me”, featuring their wonderful singer Helena May. Over to Stefan for a description: "In 2017 Jazz Funk band the Redtenbacher's Funkestra teamed up with high energy vocalist Helena May. 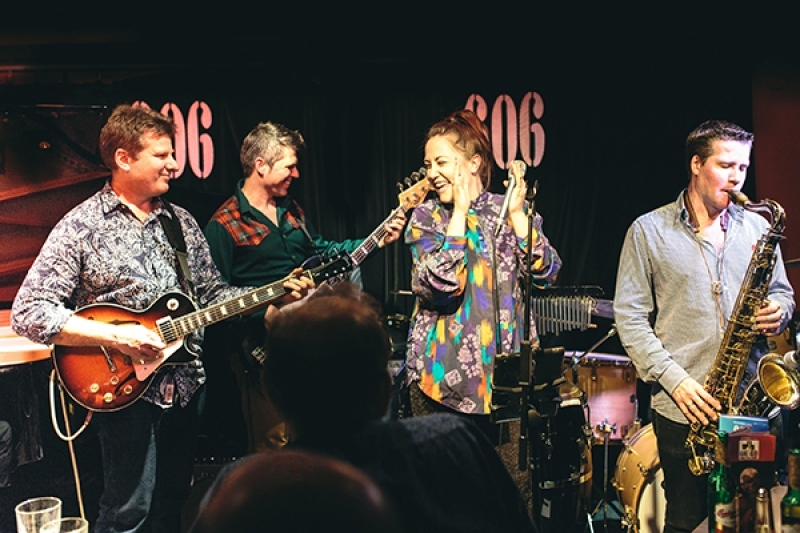 The combination of Helena's vocal style and the wall-to-wall Funk of the Funkestra has resulted in a creative ‘pop/funk mash-up’ full of fun and energy". The other musicians who make up this rocking 7 piece band are Piers Green-sax, Graeme Flowers-trumpet, Mike Outram-guitar and Mike Sturgis-drums. And watch out for Stefan's Special Guest this evening, the US star Dave Limina on organ. Dave, a Professor of piano and organ studies at the world-renowned Berklee College of Music in Boston has, after 30 years of teaching there, recently been appointed to the prestigious role of Piano Department Chair. As well as teaching he is also a sought after studio and gigging musician with credits that include work with the likes of Brook Benton, B.B. King, Chuck Berry, Martha Reeves and Grammy winner Lori McKenna. An organ specialist he is the author of the instrument’s foremost instruction book, Hammond Organ Techniques, which has been printed in multiple languages. The band, as you may have gathered by now, is highly entertaining with tremendous musicianship applied to some amazing music. A guaranteed great night out!